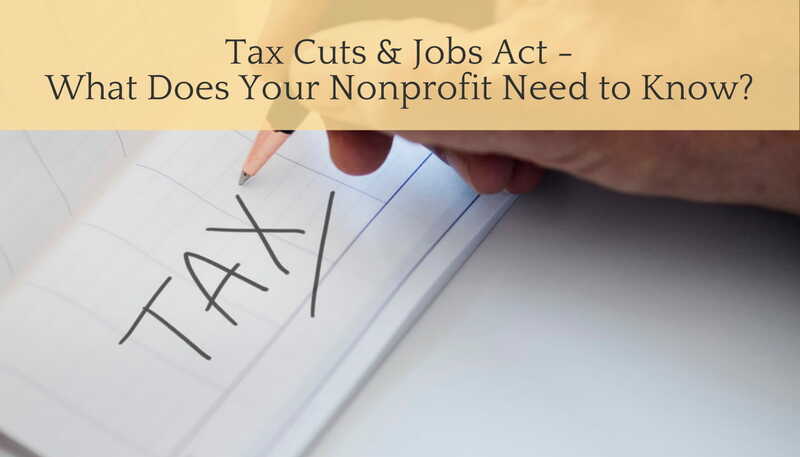 Tax Cuts & Jobs Act – What Does Your Nonprofit Need to Know? The Tax Cuts and Jobs Act (“the Act”) was signed into law on December 22, marking the largest overhaul of U.S. tax policy in decades. It will impact nearly every individual taxpayer and business in the United States. It took effect on January 1, 2018. Nonprofit organizations most certainly feel the impact of the Act, although some effects of the law will likely take years to become apparent. The Act is one of the most significant pieces of legislation in decades directly impacting nonprofits. It puts in place a number of provisions that will impact the work of nonprofits, especially in regards to fundraising. The Act doesn’t impact only nonprofits though. Virtually every person and organization are affected by it. Many see the Act as negative, but the full effects of it remain to be seen. 1. There is an Increase in the Standard Deduction. Many of the changes on the individual level, i.e. limiting state and local tax deductions, nearly doubling the standard deduction and the estate and gift tax exemptions—could leave organizations facing significant cutbacks in donations. This is probably one of the main topics of conversation when it comes to the Act. The Act nearly doubles the standard deduction for individuals and married couples filing jointly. The increase would be from $6,350 to $12,000 for individuals and from $12,700 to $24,000 for married couples, adjusted for inflation. The Act also places an annual limitation on the state and local tax deduction at $10,000 (for both individual and joint filers). These income tax changes are scheduled to remain in effect through 2025. Many fear this will cause fewer individuals to itemize, and that this may lead to a reduction in overall giving. Since a taxpayer must itemize deductions in order to obtain an income tax benefit by making a charitable contribution, a taxpayer not itemizing deductions receives no tax benefit from such a contribution. It has been estimated by the Tax Policy Center that charitable giving will decline by between $12.3 billion and $19.7 billion. Some believe nonprofits will take a major hit when it comes to their fundraising, whereas some believe donors will simply change their giving habits (e.g. give one larger gift rather than multiple small ones). 2. The “Pease” limitation has been repealed and the charitable contribution deduction limit has been increased. These two provisions might actually be the two provisions of the Act that will prove to be the most beneficial to nonprofits and charitable giving. The Act repeals the “Pease” limitation (named after former Senator Donald Pease), whose original intent was to raise tax revenue by increasing the taxable income for high-income earners. It does this by reducing the value/benefits of several itemized deductions (including charitable contributions) once a taxpayer’s AGI reaches a certain amount ($261,500 for single filers and $313,800 for married couples filing jointly). Repealing this limitation allows high earning taxpayers to go back to enjoying the full benefits of these deductions. The Act increases the charitable contribution deduction limit for an individual to 60 percent of his or her adjusted gross income (AGI), up from the current limit of 50 percent for cash donations to public charities. It is anticipated that these two measures could help prompt high earners to donate more to nonprofits. 3. The Unrelated Business Income Tax is now calculated differently. Subject to numerous exceptions, tax-exempt nonprofits that operate businesses unrelated to their charitable missions – such as selling advertising on their websites or operating a parking lot – must now account for each line of UBIT separately, meaning they no longer will be able to offset profits in one activity with losses in other activities. Any profit from a single line of UBIT, above certain thresholds, will result in a tax liability, regardless of the amount of losses in other lines. This inability to aggregate UBTI generating activities may result in increased UBIT for some nonprofits. 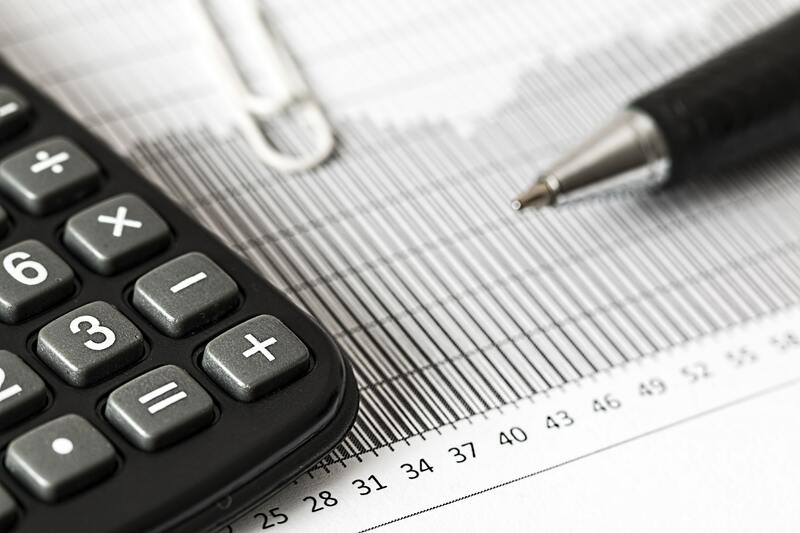 Organizations can, however, use one year’s losses on the same unrelated business to reduce taxes on another year’s operation of the same unrelated business. On the other hand, the corporate income tax rate is decreased from 35 to 21 percent, which means nonprofits will pay a lower tax rate on the UBIT than they are currently. 4. There is a New Excise Tax on Excessive Executive Compensation. This provision of the Act imposes a 21% excise tax on the portion of executive compensation (applicable to employees covered by the law) that is over $1 million a year. A ‘covered employee’ is an employee (including former employees) of the organization if the employee a) is one of the five highest compensated employees of the organization for the taxable year, or b) was a covered employee of the organization (or any predecessor) for any preceding taxable year beginning after Dec. 31, 2016. Certain medical professionals are excluded from the definition of a covered employee. Compensation includes salary/wages, separation pay including any “golden parachute” payments, and vested deferred compensation. What is important to note is that this excise tax is levied on the nonprofit organization, not the executive as an individual taxpayer. Also important to note is that the tax on regular salary includes any vested deferred compensation amounts, so if the salary is below $1 million, but is boosted over that level by vested deferred compensation, the tax liability applies. A similar requirement has been in place for many years for for-profit corporations. This new compensation excise tax will probably make the competition for capable executives even fiercer for nonprofits. 5. There is an Excise Tax on Endowments of Nonprofit Colleges and Universities. The Act includes a new excise tax of 1.4 percent on the net investment incomes of applicable educational institutions. The term ‘applicable educational institution’ refers to an educational institution which a) had at least 500 tuition-paying students during the preceding taxable year; b) the aggregate fair market value of the assets of which at the end of the preceding taxable year is at least $500,000 per student of the institution; and c) more than 50 percent of the tuition-paying students are located in the United States. Amounts used directly to carry out educational purpose are excluded from the calculation of net investment income for purposes of the excise tax. In addition to that, donors will no longer be allowed to deduct as a charitable gift 80% of the cost of purchasing seat licenses to purchase tickets at college and university athletic events. The government has never before taxed the investment earnings of universities, or endowments of any nonprofit organizations, albeit this new excise tax will affect relatively few schools. It’s important to note this doesn’t affect secondary schools. Furthermore, since the endowments of an institution’s support organizations – such as alumni groups and “friends of” groups – may count toward the institution’s endowment total, some schools will be surprised to find they have a tax liability. 6. The Estate & Gift Tax Basic Exclusion amount through 2025 is doubled. The Act doubles the estate and gift tax basic exclusion amount through 2025. Under the new law, estates worth up $11 million per person ($22 million per married couple) are exempt from the federal estate tax starting in 2018, double the amount in 2017. This will further shrink the percentage of people who are subject to the estate and gift tax, which was already quite low before the Act. 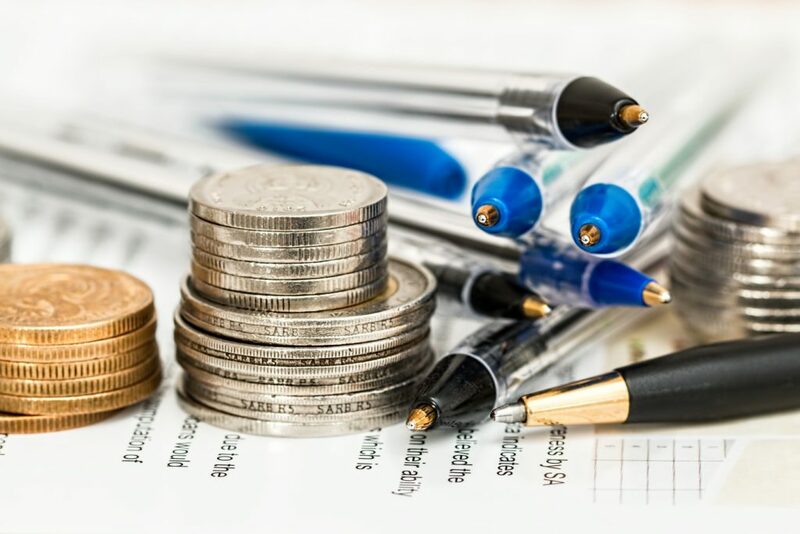 A longstanding estate planning technique used by the wealthy to lower estate and gift taxes is making testamentary bequests and inter vivos transfers for charitable purposes. Charitable bequests are not subject to this tax. Total bequest giving in 2016 was estimated at $30.36 billion, which amounted to 8% of total charitable giving. Doubling the estate tax exemption will reduce such charitable bequests in 2018 and later. So, What Should Your Nonprofit Do? Nonprofits with significant UBIT from several different unrelated activities should examine those activities that are consistently profitable, and evaluate whether the level of profitability will justify the likely tax liability going forward. Examine your organization’s compensation policies and salary levels for the five highest-paid employees (to whom this provision applies). Check if all these extra payments may require budget cuts elsewhere. Smaller colleges with sizeable endowments and active support organizations should examine if a tax liability looks likely, and speak to their tax advisors. This would include reviewing the assets of related organizations, which may count toward the student and asset thresholds of the tax. Schools that are subject to the excise tax should consider whether there are any investment assets that could be used directly in carrying out an exempt purpose to reduce the tax. Communicate and do outreach. If your organization relies on smaller to medium-sized donations from a broad mix of donors, put extra resources into your marketing and outreach efforts this year. Make sure your supporters understand how their donations help you carry out your mission. Nonprofits are impacted significantly by various aspects of the Act. It can be challenging for nonprofits, who often struggle with allocating adequate resources to things like tax, to handle these changes. All these changes are leaving nonprofits facing significant cutbacks in donations, even if it will take some time for it to become apparent. Comprehensive and dedicated fiscal management that takes a holistic approach including the tax, audit, fundraising and executive functions will be more vital than ever this year. Your nonprofit will have to work with tax professionals to assess the impact of each provision of The Act. You should ensure you have a person or a team dedicated to matters of tax and The Act this year. Make sure you set up your data collection systems since a substantial amount of data will need to be readily available. All of this can be overwhelming for a nonprofit. To keep sane and productive, establish some priorities for your organization following a conversation with your team and your tax advisor. Focus first on those things that will have the largest impact on your nonprofit. If you need more nonprofit tips, beyond tax reforms, check out our nonprofit blog. The Tax Cuts and Jobs Act – What Nonprofits Need to Know by Richard L. Fox, Esq. and Joshua D. Headley, Esq. How are Nonprofits Affected by the Tax Cuts and Jobs Act by Stephen Fishman, J.D.